A random box of Trefoils in the kitchen at work reminded me that I never wrote a recap of the Marine Corps 17.75K that I ran earlier this year. 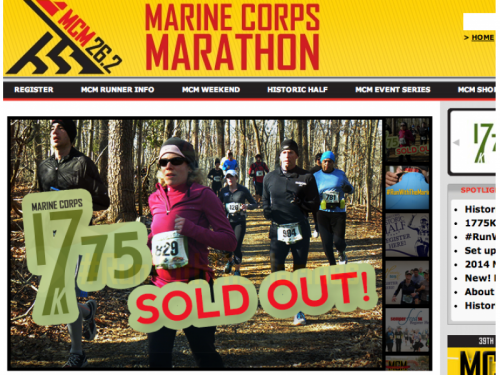 The main reason most people run this race is the guaranteed registration for the Marine Corps marathon in the fall. That is exactly the reason my friend, Aimee, and I decided to run this race. There are other ways to get into the MCM, like get lucky and be chosen in the registration lottery, or run and raise money with a charity group. Neither of those things sounded like enough of a sure thing to us mega-planners, though, so we decided to try to get in through this one. 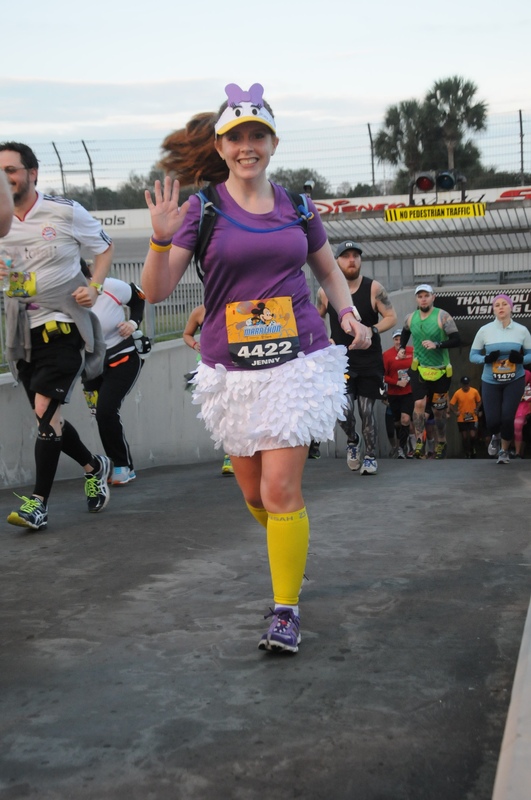 Let me tell you, the most stressful part of this race is REGISTERING for this race. I went in ahead of time and created an account on mcmregistration.com, as was recommended by everything I read. Then at 11:57AM, I had my finger on my mouse hitting “refresh” every 5 seconds. Right at noon, the page turned into a registration form, which was already filled out with my info since I had logged in, so I clicked “Continue.” And the little runner dude icon jogged for a few seconds. And I got an error on the page. Gah!! I didn’t confirm my email address. Ok. Done. “Continue.” Error on page. WTF??? My cubicle neighbor pops her head over the wall to chat. I throw up my hand and snap, “Don’t talk to me right now!! !” She retreats. I realize I didn’t put my estimated finish time in correctly. I put 2:00, and the proper format is 02:00. Good grief. Fine, “Continue.” Runner dude icon jogs again. And jogs. And jogs. Freaking. OUT. Finally, the credit card page pops up and, since I have that sucker memorized, I typed it in super fast and hit “Continue” one more time. Finally! I’m in! Whew, that was intense! After all that, the costumes were easy. We went with a Girl Scout theme since it was cookie season (yes, that’s totally a season). I used Jalie 2215 for the skirts and just kinda winged it for the sashes. There aren’t any patterns for one out there, so I used the measurement from my shoulder to hip, doubled it, and added 1/2″ for seam allowances. For Aimee’s I added 2 inches to my measurement, but probably could have added a little more since she’s so tall. The sashes were the best part though. 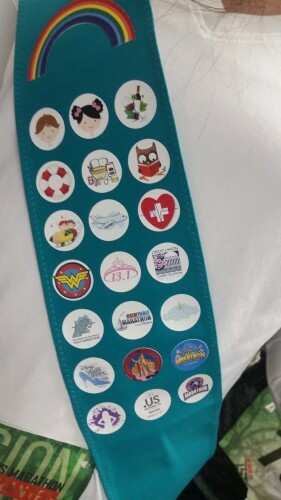 I had a blast finding images for races we’ve done, our hobbies, kids, pets, and a couple actual Girl Scout badges that I earned in real life! We made sure to bring cookies to the race since we knew people would be asking for some. 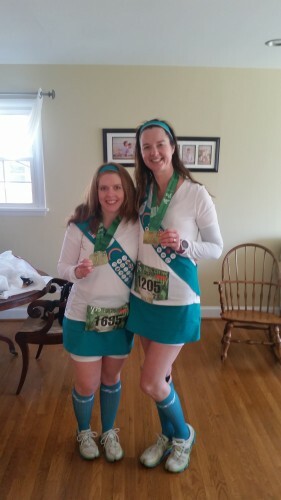 And since it’s not really a costume race, we knew we would get some strange looks. But what we weren’t prepared for was the interrogations from Girl Scout leaders. 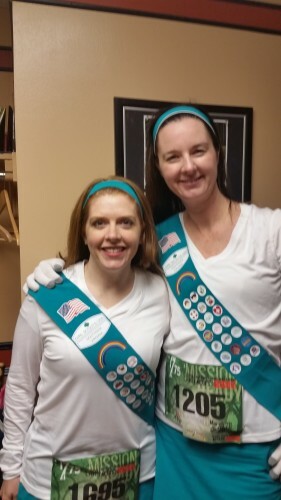 “Are you Girl Scout leaders?” “Where did you get those uniforms?” “Are those real badges?” Uh, we’re just wearing a costume and having a little fun. They did not seem to think it was fun. I felt like one of them was going to call someone and turn us in! I’m not sure who she could call and what she would tell them, but she was not happy with the child impersonators. 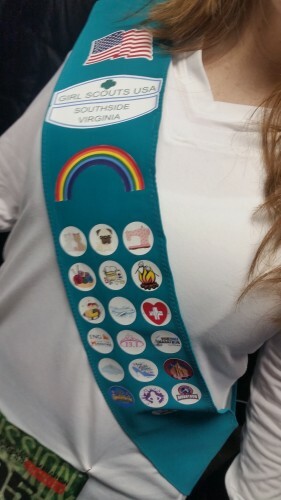 Now we know: don’t wear Girl Scout costumes where Girl Scout leaders may be. Another thing we now know: Listen to the weatherman the night before! We were SO. FREAKING. COLD. out there in our little skirts. It was like 28* at the start. Here we are hiding out in a nice warm church waiting for the race to begin. Oh yeah, there was also a race! 17.75K equals out to around 11 miles, so we just treated it like a casual weekend long run. The course is really hilly, though, so be prepared. We ran up most of the hills, but took it easy on the last couple. We even stopped to chat with people we knew at the water stops and still finished at our 2 hour goal. The course was half on a trail and half on the road. The trail was mostly packed dirt but there was some mud, rocks and debris. But we made it without falling, if you’re worried about that sort of thing. I was! And then we got our medals and (the reason we were there) ACCESS GRANTED tickets! It was important to us that we get into this race so we could register for the 40th annual Marine Corps Marathon since we both turned 40 this year. I know that it will be worth the stress, hills, frozen thighs, and judgey Girl Scout leaders once we get to that start line on October 25th! 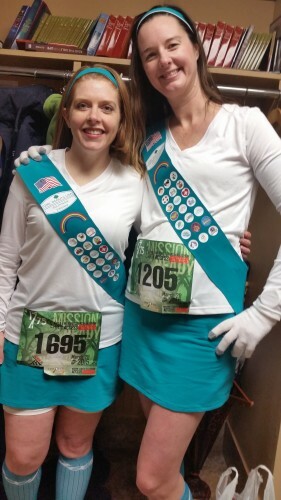 I cold but fun race despite all the girl scout leaders trying to hunt us down!